Derek Swatsworth, Lezzer store manager explains product features to a customer. Since the Great Recession, CEO Mike Lezzer has focused on employee training to strengthen the company. Mike Lezzer, CEO of Lezzer Lumber in Curwensville, Penn. has a unique way of motivating his staff to provide the best service they can on behalf of the company—he has opened up the books and offered to train everyone to advance their careers. At Lezzer Lumber, everyone knows the bottom line, and from Mike Lezzer’s experience, opening that information up to employees, showing them how their performance directly affects profits, then allowing them to rise in the company to make the most of their knowledge, has raised the bottom line and improved company’s standing in the market. Through sales training, product knowledge demonstrations and more customer interaction, the staff at Lezzer Lumber has grown to see just how their sales and service affect the overall performance of the company. With nearly 400 employees—including 40 outside sales reps—that serve a customer base of 90% pro contractors, team members at Lezzer Lumber get in-depth exposure to products and services that extend well beyond helping the occasional DIY customer. Last year, Lezzer Lumber, a member of the LMC buying cooperative, launched its own in-house training institute called Lezzer Technical Institute. With ideas supplied in part from the National Retail Hardware Association, the company developed programs for younger employees who have aspirations for growth. Lezzer set up a series of three to four classes that covered basic product information, as well as sales training and sales estimating. 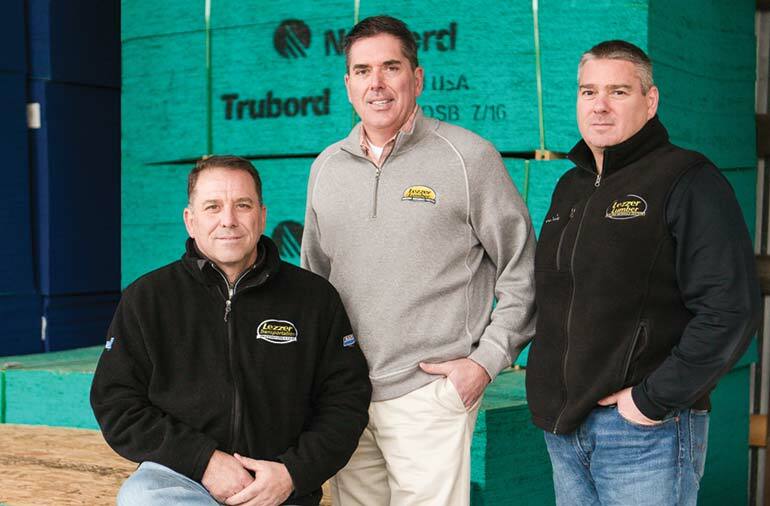 Lezzer Lumber is in its third generation of family leadership. From left to right: David Lezzer, president; Mike Lezzer, CEO; K.C. Lezzer, executive vice president. Training at Lezzer Lumber has been a hit, Mike Lezzer said. Though he wasn’t sure how veteran employees would react to a required training course, he said there has been an overwhelmingly positive response. Even though some of the veteran employees weren’t required to complete the basic training sessions, 100% of them did. To reward employees completing training, each receives certificates of recognition as well as gift cards to area businesses. The higher an employee advances in the courses, the higher the value on the gift cards. We believe our employees are our biggest asset. We have a knowledgeable, dedicated group of employees who are career oriented and have been with us for years.